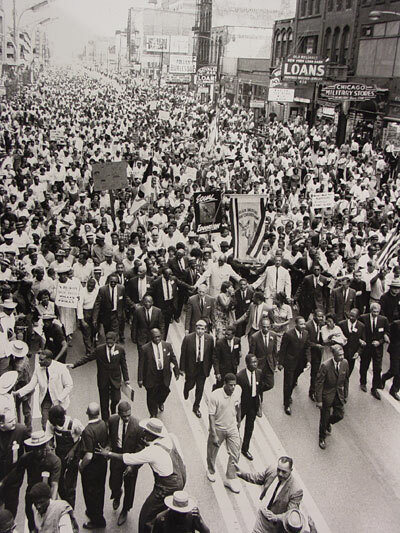 Collective struggle, enduring trials, and transcendence: The legacy of Dr. Martin Luther King Jr. exemplifies all of these qualities and continues to inspire IMAN’s work today. In a recent DeenTV appearance, Executive Director Dr. Rami Nashashibi shared some big news about the planned MLK Memorial in Marquette Park: The memorial will be unveiled on August 5, 2016 during the Takin’ It to the Streets festival — on the 50th anniversary of King’s historic march through the park (pictured here) — thrusting IMAN and its allies in this effort onto the national stage, inshaAllah. Once known as a community where Neo-Nazis demonstrated, Marquette Park will become the site of an interfaith, multicultural celebration like no other. As a result of the sacrifices that Dr. King and local activists in this area made, and the struggles of those who have continued their legacy, today’s Marquette Park community is vibrant and diverse. Embodying this progression, renovation work at IMAN’s Youth & Arts Wellness Center has kicked into high gear. 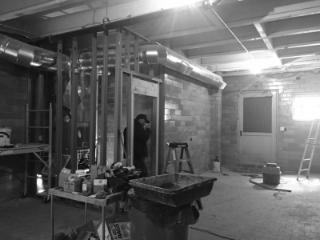 As walls come down, the vision of a new focal point of creative expression on the Southwest Side builds up. “Art is not just about entertainment. Art is about powerfully, radically re-imagining the world,” says Dr. Nashashibi. 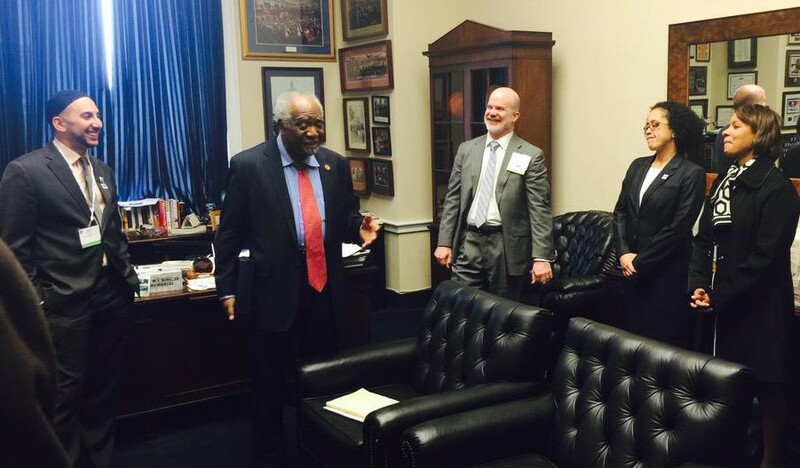 From March 18th to 22nd, an IMAN delegation visited Washington, D.C. for the National Association of Community Health Centers’ (NACHC) Policy and Issues Forum, which commemorated the 50th anniversary of U.S. Community Health Centers. The Forum engaged leaders in the community health field, hosted discussions on best practices, and, most importantly, was a site of intense advocacy. Health care funding is at a critical stage: If Congress does not act, the Health Center Fund will expire on September 30, 2015, reducing funding up to 70%. During this four-day trip, we heard IMAN’s community health model being confirmed — that our present health clinic and future health center must always be an integral part of community organizing work. While in D.C., IMAN staff learned from Congressman Danny K. Davis and other long-time activists that the history of community health centers in the United States is steeped in intentional community activism. Dolores Huerta, who famously organized with Cesar Chavez, delivered a passionate speech stating that community organizers should be part of every community health center’s staff. Steadfast in commitment to dignity and justice, we must never lose sight of the fact that health care is a human right and protecting resources that provide these services is critical. In March, IMAN organizers Shamar Hemphill and Sara Hamdan traveled to Philadelphia to visit The Food Trust, a local organization dedicated to nutrition education and increasing access to affordable, healthy food. 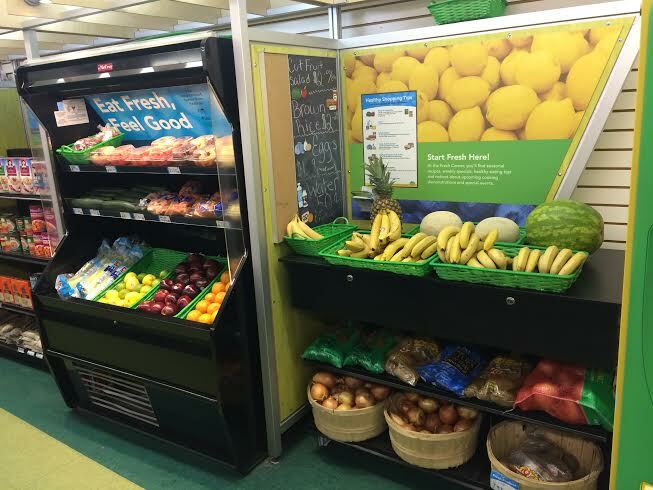 For over 20 years, The Food Trust has developed and successfully implemented a model for converting inner-city corner stores into hubs of healthy living. 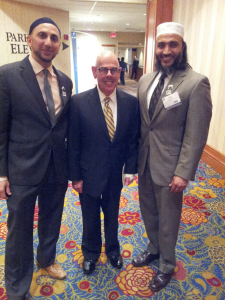 IMAN has drawn from their Healthy Corner Store Initiative model in Philadelphia to help inform the Muslim Run campaign. Shamar, Sara and members of The Food Trust shared best practices, as well as challenges of doing corner store conversion work in Chicago and Philadelphia respectively. 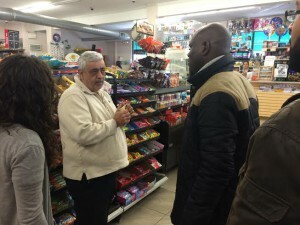 They also toured several corner stores that are participating in the Healthy Corner Store Initiative. These stores were given access to produce displays and in-store marketing materials to encourage consumer consciousness. As a result of their commitment to working alongside The Food Trust, several store owners spoke of their continued commitment to providing the community with increased healthy options. In addition to visiting corner stores, Shamar and Sara were given a tour of The Fresh Grocer, a grocery store located within the nation’s oldest African-American owned and operated shopping center. 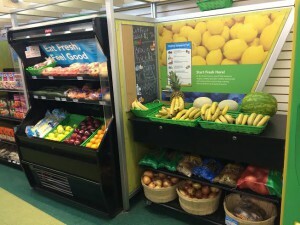 The Fresh Grocer was financed in part by the Pennsylvania Fresh Food Financing Initiative, and serves as a powerful example of what a broad coalition of community partners and allies can do collectively. The Muslim Run team is eager to continue strengthening their corner store model, working with store owners, local residents, and IMAN leaders to build the dignified, healthy spaces our communities deserve. If you would like to get involved with IMAN’s Muslim Run corner store campaign, please contact Sara Hamdan (sara@imancentral.org).